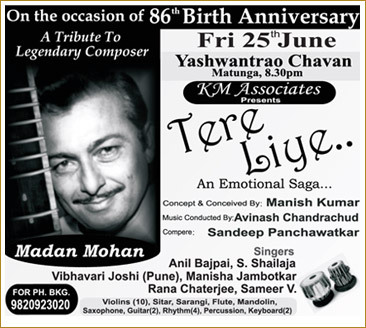 On 25th June 2010, music lovers in Mumbai will have the unique opportunity to attend two options of concerts being organized to commemorate Madanji's 86th birth anniversary. KM Associates will present a concert, "Tere Liye... An Emotional Saga..." at the Yashwantrao Sabhagraha in Matunga (Mumbai, India). This concert has been conceived and produced by Manish Kumar Chauhan under the brand of Lets Go Legend. They have earlier presented successful concerts, since a year on Mohd. 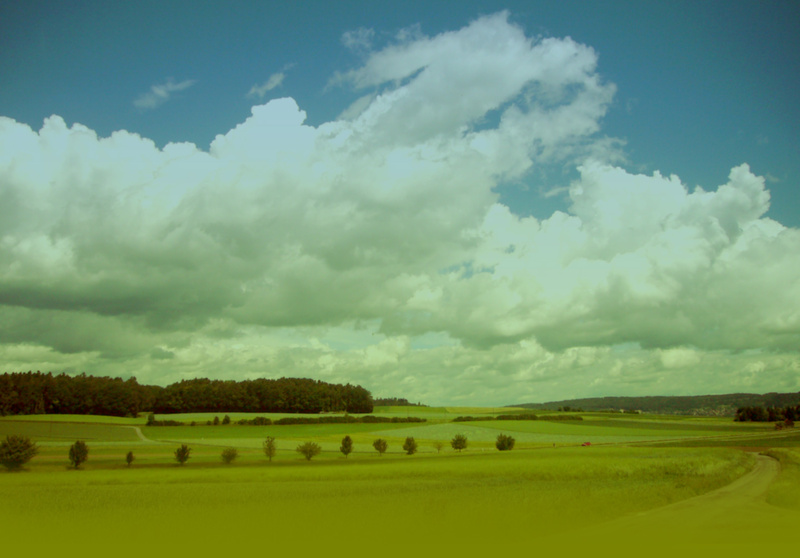 Rafi, R.D. Burman and other legends... This is their first show on Madanji. The 25 member orchestra will be led by Avinash Chandrachud and will feature acoustic instruments to reproduce the golden era. Various violins, a sitar, sarangi, saxophone, mandolin, flute and of course a rhythm section and guitars and keyboards will embellish Madanji's melodies which will be rendered by Anil Bajpai, S. Shailaja, Vibhavari Joshi, Manisha Jambotkar, Rana Chatterjee and Sameer V. The concert will be compered by Sandeep Panchawatkar. Scheduled to begin at 8.30 pm, Tere Liye will be a much looked forward to event by Madanji fans, who can make bookings by contacting 9820923020. At Ravindra Natya Mandir, Prabhadevi (Mumbai, India), yet another concert of Madanji's songs will be performed by a group of talented artistes and musicians. The organizers have earlier presented various Madanji concerts. Anand Sahasrabudhe will lead a 26 member orchestra which will feature only acoustic instruments as the grand piano, violins, cellos, accordian and sitar. Madanji's well known songs will be performed by Anand Sawant, Sonali Karnik, Archana Gore and Bela Shende. Ambarish Mishra will compere the show. 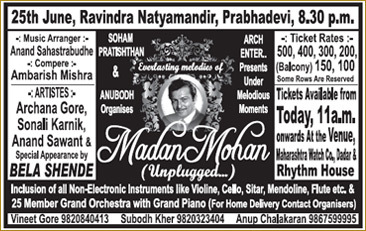 Both the concerts will be memorable events for fans of Madanji's music.